Rec. : 1990 Stiftskirche at Oberkaufungen. Helmut Rilling, who is known for his recordings of Bach's cantatas, as well as many other of Bach's works, directs a recording of Bach's motets, sacred, choral works which are among Bach's finest works for the choir. 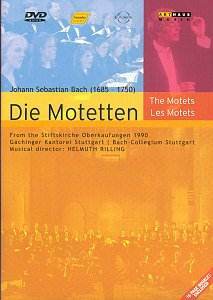 Motets are essentially choral solos, with a limited instrumental accompaniment. They can be performed in many different ways, with forces ranging from one to two voices per part (such as Cantus Colln's recording) or with a huge choir, as here, with almost 40 singers. There are differences in tempi as well, with some of the smaller ensembles performing them at what can rightly be called top-speed, and others, such as Rilling's choir here, performing them slowly and meditatively. These works are very hard to perform; their lush polyphonic texture is difficult to render, and these difficulties are apparent here. Rilling's choir is often top-heavy, with the sopranos sounding almost shrill on this recording. Part of this is indeed the recording, which is shallow and lacking in dynamic range, but Rilling seems to favour the higher voices too much, neglecting the foundation of the music. For Rilling's credit, it must be pointed out that he performs all the motets here - including some that are considered spurious - providing one of the few truly "complete" recordings of these works. But after a while, they all sound alike. Rilling is unable to make the vocal textures come alive, and the sound of each motet seems to be a repetition of the previous ones. There is no attempt to change the tone colours in any way; it seems as though Rilling is conducting these pieces just to play them, not to give any kind of original performance. The filming is unimaginative - though how much imagination can you use when filming a large, static choir - and since the sound is poor, there is little reason to buy this DVD instead of a CD, except for the presence of all of Bach's motets. This DVD is interesting for its contents - all of Bach's motets, including the spurious ones - yet the performance falls flat and the sound is disappointing. You are better off buying a CD of these works.